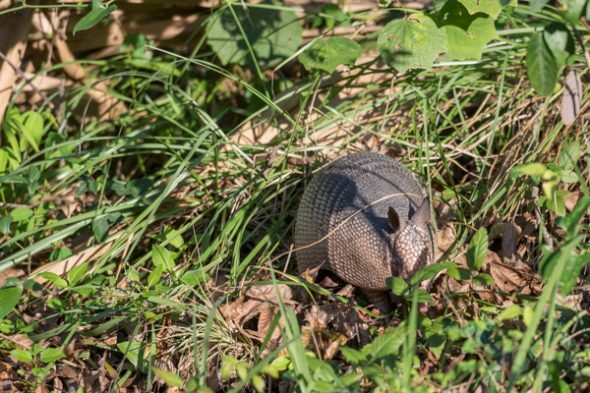 This is the only LIVE armadillo that Storm and I have ever seen. At Jim Brown’s welcome suggestion, we make Blue Spring State Park our next tourist destination. Here Manatees gather in the warm waters to observe tourists displayed above them on large platforms overhanging the water. Some of the tourists even bring their young so the Manatees get quite a show from their temperate and placid viewing area. This is a clean, well-kept park with camping, biking, hiking, snorkeling, paddling, picnicking – you name it and they probably have it here. We even saw an armadillo foraging in the grass near a picnic area in this park. During the winter, the Manatees come to swim, rest, play and people watch in the 72 degree water. If you want them to see you while they are here, try to visit during the week and as early in the day as you can because once this park is full you will have to wait for someone else to leave before you can get in! 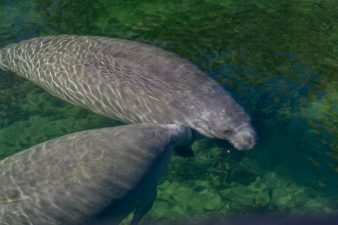 For a good view of the Manatees in the following video, be sure to bump up the video quality in your YouTube viewer settings. N. Clement highly recommends you buy a snorkle and some fins, and a mask of course, and go swimming with them. One of the highlights of my scuba trip to crystal river several years ago. In fact, you might go every Sunday morning. Better than any church I ever went to, in my opinion. I like that idea! I sure hope we can fit in a swim before we leave.